D.65A. Haarlem, Teyler Foundation, (photograph no. K.I.74). PROVENANCE: Queen Christina of Sweden (information from the museum). Carroll, 1987, 278, 281, n,. 2, under no. 88, as a copy of a lost drawing by Rosso or by an assistant. D.65B. St. Petersburg, Hermitage, no. 16562. Pen and ink and wash, 29 x 41.5; wm. ; creased down the center. The background of this drawing is incomplete. 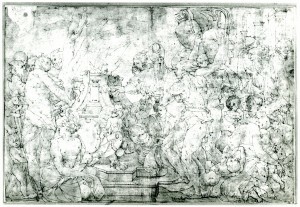 PROVENANCE: Betsky; The Academy of Fine Arts; the drawing entered the Hermitage in 1924 (information from the museum). Dobroklonsky, 1927, 31, no. 67, as Rosso, and as formerly attributed to Niccolò dell’Abate. Dobroklonsky, 1962, 11-15, 47, and Fig., as Rosso. Béguin and Pressouyre, 1972, 138, as anonymous, and as either a copy of Rosso’s fresco or of one of the last “mises au point en vue de la fresque;” and mistakenly as published by Y. Kustnesov. Carroll, 1987, 278, 281, n. 2, under no. 88, as a copy of a lost drawing by Rosso or by an assistant. D.65C. Turin, Biblioteca Reale, no. 15661. Pen and ink and wash, 27.5 x 40; wm., a pitcher surmounted by a cross. Creased down the center. Weigel, 1865, 656, no. 7735a, as Rosso (referring to a photograph in C. Marville, Collections de Dessins des Musées de Turin et de Milan, Paris, 1864). Bertini, 1952, 314, n. 9, as a copy of Rosso’s fresco. Bertini, 1958, 51, no. 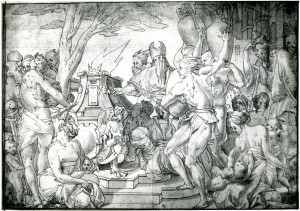 382, as a late sixteenth century copy of Rosso’s fresco. 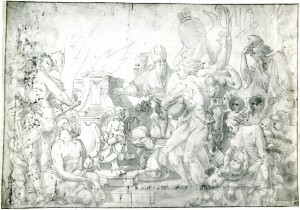 Béguin and Pressouyre, 1972, 138, as a late sixteenth century copy of the fresco or of a drawing for it. Carroll, 1987, 278, 281. n. 2, under no. 88, as a copy of a lost drawing by Rosso or by an assistant. 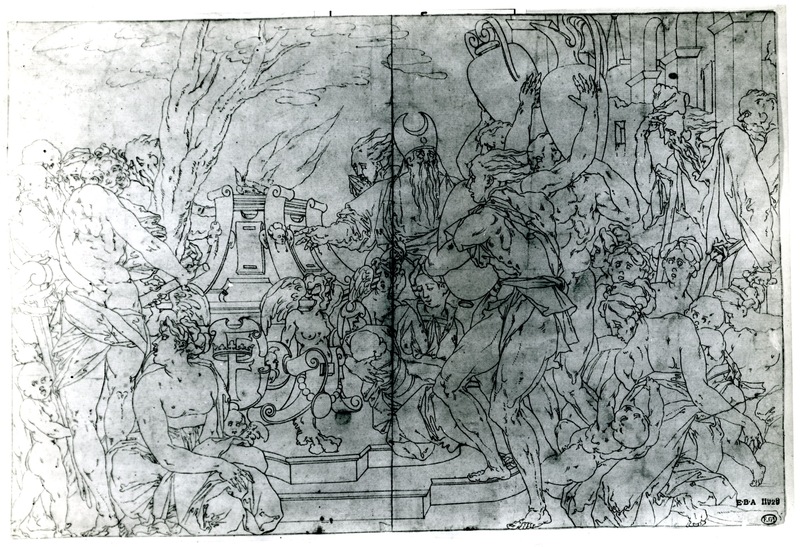 These three drawings are copied from a lost drawing for the Scene of Sacrifice in the Gallery of Francis I (Fig.P.22, VII N a) that was almost identical to the lost drawing of which there is a copy in the Ensba in Paris (Fig.D.64).2 Where the three drawings differ from the latter is in showing the center of the shield on the altar convex instead of flat and in showing that shield and the one on the right side of the altar blank instead of with the Royal F. Furthermore, in the three drawings there is no passage of drapery down the back of the foremost vase-bearer. 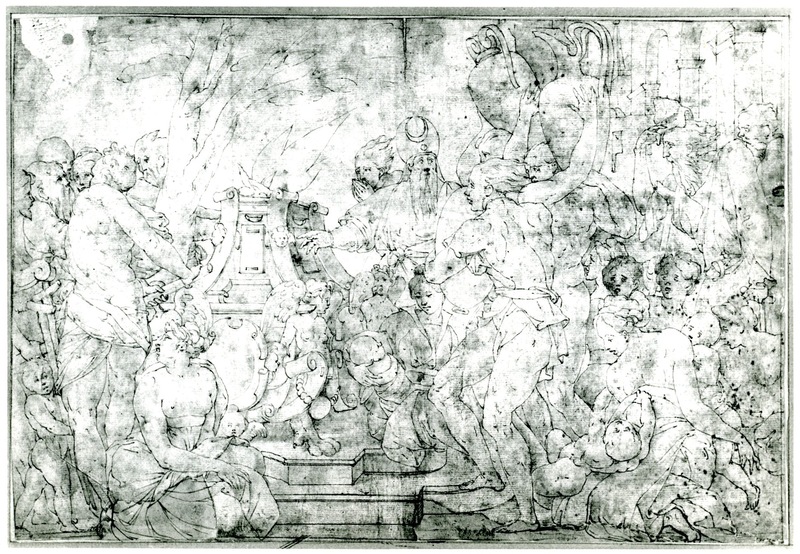 In this last detail, these drawings resemble the fresco in the Gallery of Francis I. But there the front shield is flat and shows the Royal F, as also in D.64. (The second shield in the fresco is now much effaced). 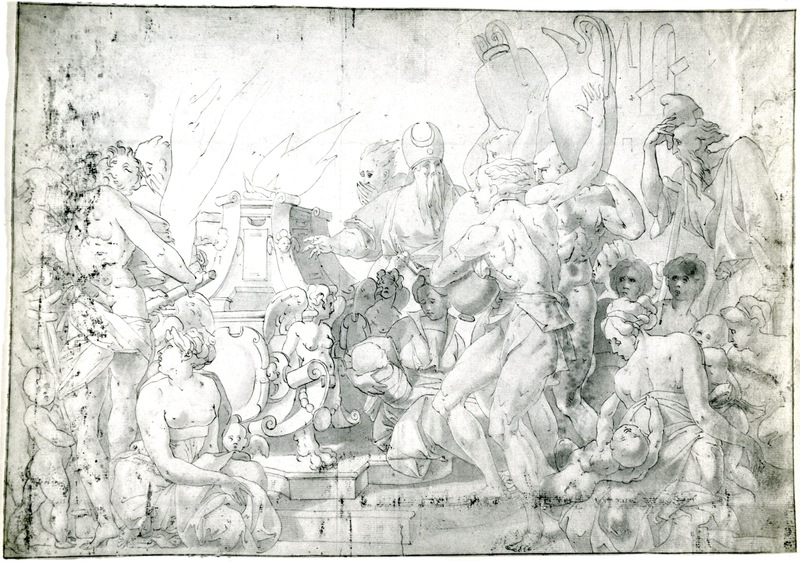 Although the range of values of the washes in the three drawings is not alike, all three basically show the same placement of shadows; for example, the right side of the altar and the harpy there are in shadow. The washes are evenly set down in the Turin and St. Petersburg drawings, giving a very generalized surface to all the forms. In the three drawings, of which the Haarlem drawing is the most sensitively executed, the pen lines are similar in being without the range of variations that are found in D.64. For example, the old bearded head immediately to the left of the tree is described with many more kinds of strokes in D.64 than in the three copies of D.65. The elimination of the passage of drapery on the back of the foremost vase-bearer indicates that these drawings are derived from a lost drawing that was done after the one that is represented by D.65. But it may be questioned that Rosso himself would make what is almost a complete repetition of the original of D.64 simply to record this small change, and to show the shields blank when in the fresco the front one again carries the Royal F. What may be the case is that all three copies, none of which can be considered the prime one upon which the others depend, go back to a lost studio drawing that was copied from Rosso’s own drawing, also lost, that was made just before the cartoon for the fresco was executed. This might account for why all three copies seem to reflect a drawing that was less finely executed than the original of D.64. 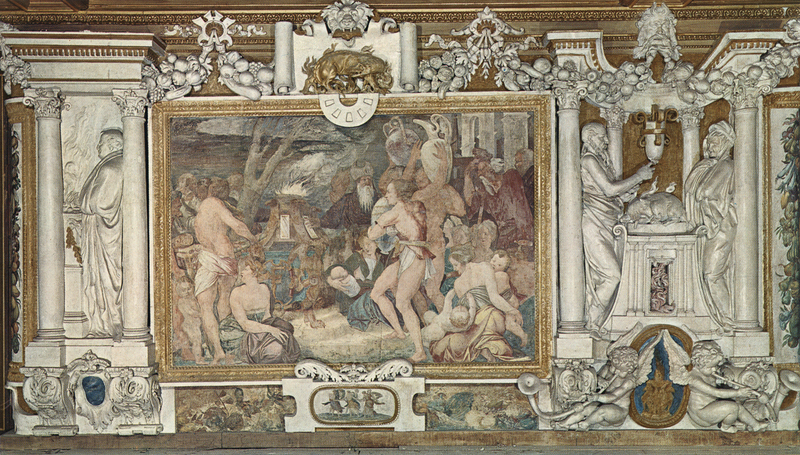 Still, this would not have been the last version of the scene, for the fresco shows the front shield of the altar flat and with the Royal F. These could have reappeared in the cartoon for the fresco. 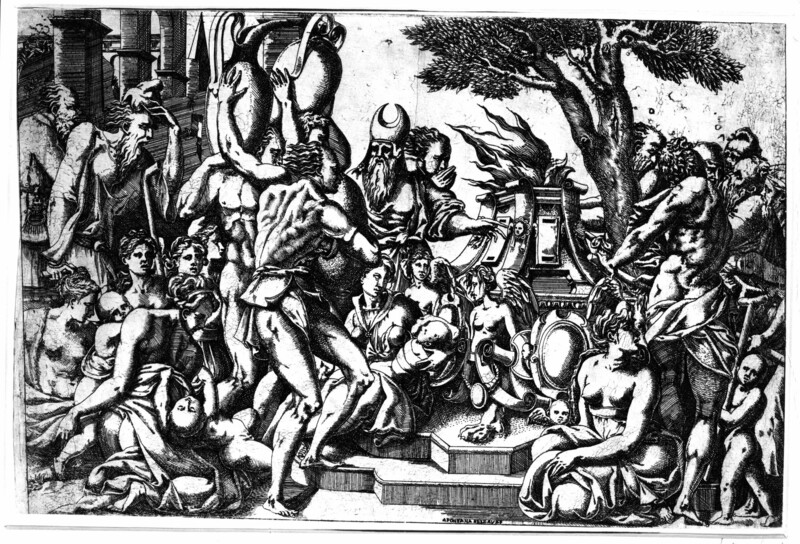 PRINT: Fantuzzi, E.77 (Fig.E.77). Etching based either on the lost original of E.65 or just possibly on another almost identical lost drawing but with a few different details. 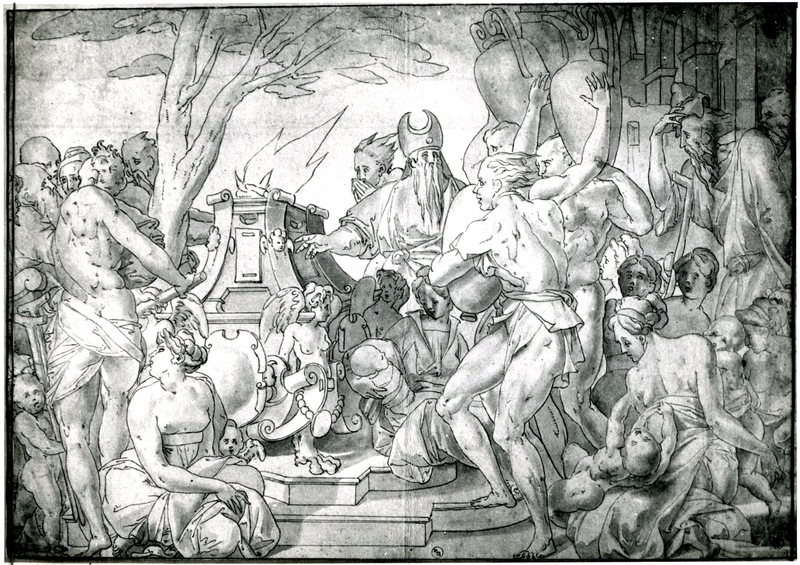 1 The identification of this drawing with Rosso’s fresco in the Gallery of Francis I was first made by Professor I. Q. van Regteren Altena. 2 Another drawing in a private collection in New York is mentioned in Béguin and Pressouyre, 1972, 138, as Rosso (?). Béguin informed me that this drawing is in the Wildenstein Collection, where it is not; this seems to be a mistaken reference to the Wildenstein drawing of The Royal Elephant (D.54C).